Tiresias is a performance of endurance and transformation inspired by the mythological figure of Tiresias, the blind prophet of Thebes. Tiresias is a four to five hour durational performance. Tiresias is a mythological figure, the blind prophet of Thebes who is famous for being transformed from a man into a woman for seven years. During the live performance, Cassils’s body is pressed up against the back of a neoclassical Greek male torso carved out of ice for precise contact with the artist’s physique. 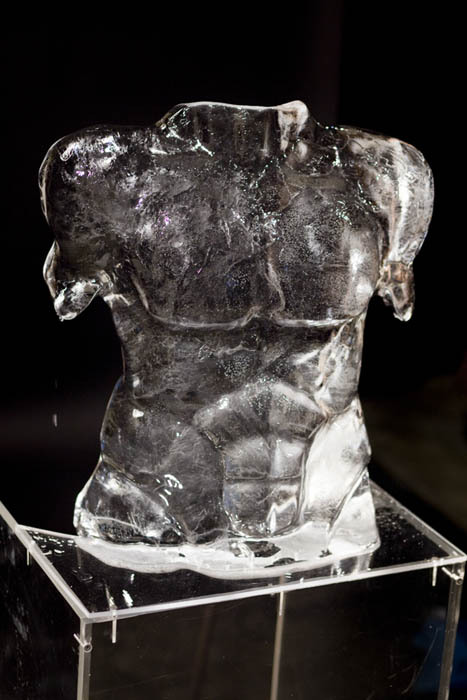 Cassils melts the ice sculpture with pure body heat, demonstrating the instability of the body and our desire for a certain unsustainable physique. Recasting the myth of Tiresias as a story of endurance and transformation, Cassils performs the resolve required to persist at the point of contact between masculine and feminine. Tiresias also exists as a single channel video installation that collapses the performance into a 15 minute loop. The life-sized video is rear-projected onto floating plexiglass. Two shots are employed in this document: one which frames Cassils’s body from the waist up, and another which offers closeup shots of the subtle changes taking place during the performance, such as droplets slowly forming, the ice rising and falling with the rib cage, and the reddening of the skin. Accompanying this video is an ambient sound track which blends birdsong – Tiresias was clairvoyant and interpreted birdsong to predict the future –, the sound of melting ice, and a vocal performance of Winterreise (Winter Journey), a song cycle for voice and piano by Franz Schubert. The vocals are performed by the artist’s brother, Matthew Cassils, a classically-trained opera singer. The sound design was made in conjunction with Kadet Kuhne.